Home » »Unlabelled » Nail Biting Is A Sign Of THIS Personality Trait! Instead, the study – published in the Journal of Behavior Therapy and Experimental Psychiatry – points the finger at… perfectionism? In other words, it’s not anxiety that nail-biters are trying to quell; it’s frustration. To reach this conclusion, researchers studied 48 participants. Half of them were individuals who engaged in repetitive behaviors like nail-biting. They had the participants fill out a number of surveys designed to test their organizational behavior and emotion regulation. Subsequently, the nail-biters were identified as organizational perfectionists. As reported by Scientific American, organizational perfectionism is characterized by a tendency to over-plan, over-work and become frustrated by a lack of activity. Nail-biting helps perfectionists feel less frustrated in the present. As you might expect, it helps them release some of that pent up energy and intention. However, this satisfaction does not last very long as it’s quickly replaced by pain and, potentially, embarrassment. While nail-biting might seem like a relatively harmless activity, it actually has the potential to cause quite a bit of long-term damage. 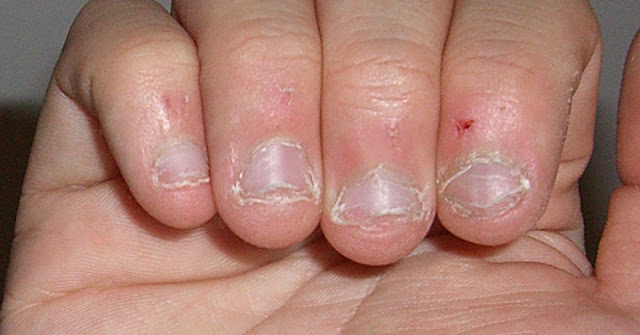 According to WebMD, nail-biting can lead to infections, weakened teeth and shame-inducing deformation of the fingernails. Those risks, along with the prevalence of nail-biting, have made it a prime target for psychotherapists, who try to help their patients move past the behavior. This new study has the potential to help those therapists better understand their patients and what causes their behavior. “These findings suggest that individuals suffering from body-focused repetitive behaviors could benefit from treatments designed to reduce frustration and boredom and to modify perfectionist beliefs,” said Sarah Roberts, one of the study’s additional authors. Do you frequently bite your nails? Would you consider yourself a perfectionist? You think in very black and white, ‘all-or-nothing’ terms. You’re very hard on yourself. When you don’t achieve a goal, you become depressed. Even when you do achieve a goal, that success is not enough to make you happy. You never start a project until the ‘right’ moment – which often never seems to come. The good news is that, when managed correctly, perfectionism can actually make you an incredibly driven and talented person. Check out this book from Dr. Martin M. Antony and Dr. Richard Swinson to learn more. Check out this video for a few tips to stop biting your nails! This article was republished from davidwolfe.com.